More than one-third of US nuclear plants are unprofitable or scheduled to close. If they’re replaced by natural gas, emissions will rise—with serious consequences for the climate. Nuclear power is the single largest source of low-carbon electricity in the United States. In 2017, some 99 nuclear reactors operating at 60 plants provided 20 percent of the nation’s electricity. Interactive feature: The future of US nuclear power. But the numbers are changing. Cheap natural gas and renewable energy, diminished demand, rising operational costs, and safety and performance problems are all threatening the profitability of nuclear power plants—and increasing the likelihood that reactors might close. If natural gas or coal replaces them, emissions will rise—and our ability to fight climate change will become that much weaker. To better understand these pressures, the Union of Concerned Scientists (UCS) assessed the economic viability of the US nuclear fleet. We analyzed which reactors were most at risk of early retirement and analyzed the impact of their retirement through a range of scenarios. We also assessed each reactor’s safety and performance. 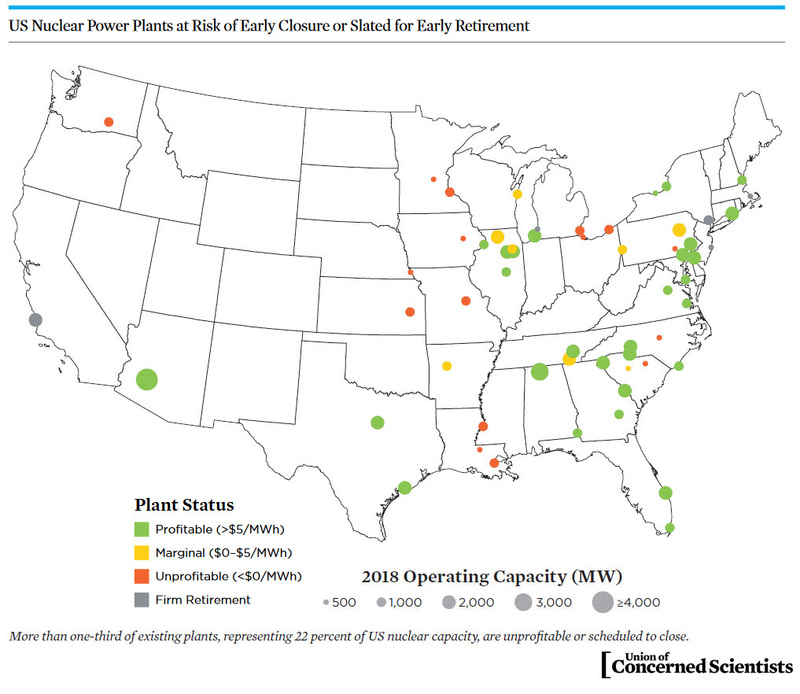 We found that nearly 35 percent of the country’s nuclear power plants, representing 22 percent of US nuclear capacity, are at risk of early closure or slated to retire. To help avoid the worst consequences of climate change—and avoid costly overreliance on natural gas—we need carbon-reduction policies that better reflect the value of low-carbon electricity. Of the 30 states with nuclear power plants, 17 have nuclear capacity that is unprofitable or scheduled to close. Using projections from S&P Global Market Intelligence, UCS estimated the annual operating margins (revenues minus cost) for 92 reactors at 55 plants. We then classified reactors as unprofitable, marginal, or profitable, and analyzed the impacts of early plant retirements and how clean energy policies could help. Plants across the country are facing the prospect of early retirement. Click to enlarge. More than one-third of US nuclear plants are unprofitable or scheduled to close. On average, it would cost $814 million annually to bring unprofitable plants back to a breakeven point. Plants owned by merchant generators that sell power into competitive wholesale markets face a higher risk of closure than regulated utilities that recover their costs from ratepayers. Without new policies, natural gas and coal will fill the void. 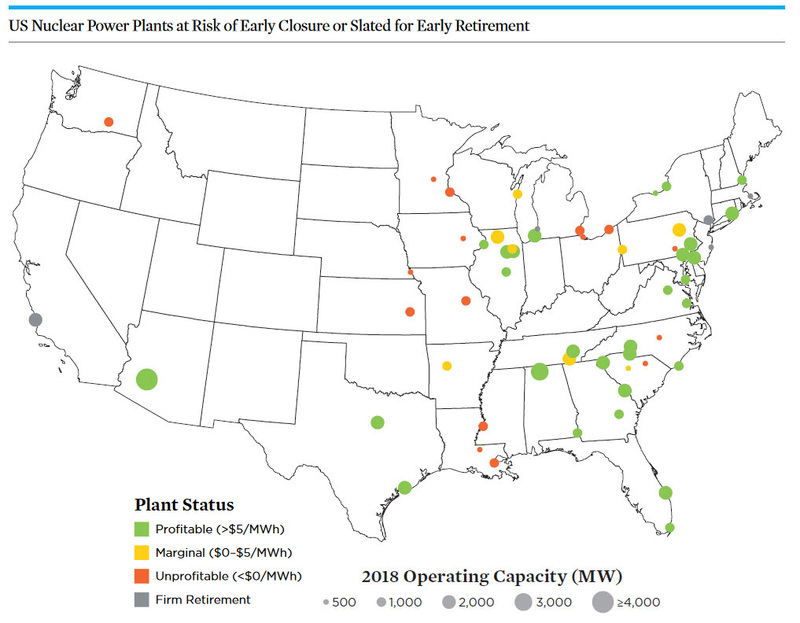 Closing unprofitable and marginal at-risk plants early could result in a 4 to 6 percent increase in US power sector emissions. Carbon-reduction policies would diversify our nation’s electricity mix, while preventing early closures. Nuclear generation would stay near reference case levels and renewable energy generation (primarily wind and solar) would more than triple by 2035. Carbon-reduction policies work—and they’re affordable. A national carbon price and/or low-carbon electrify standard (LCES) would help avoid an overreliance on natural gas, while costing the average US household only $0.74 to $1.03 per month. Benefits exceed the costs. The public health and economic benefits of carbon-reduction policies are twice as high as the costs. Between 2018 and 2035, total net benefits would exceed $230 billion under the carbon price and $60 billion under the LCES. Given the unique safety and security challenges associated with nuclear power, we also evaluated the safety and performance of US nuclear reactors since 2000 based on data from the Nuclear Regulatory Commission (NRC). We found that today’s nuclear reactors achieved the NRC's top safety rating 80 percent of the time. When a reactor dropped out of the top category due to performance issues, it took an average of one year to remedy the shortcomings. We need carbon pricing. A robust, economy-wide cap or price on carbon emissions would help provide a level playing field for all low-carbon technologies. We need a low-carbon electricity standard. A well-designed LCES could prevent the early closure of nuclear power plants while supporting the growth of other low carbon technologies. Financial support for nuclear plants should be conditioned on consumer protection, safety requirements, and investments in renewables and energy efficiency. Policymakers considering temporary financial support to avoid the early closure of nuclear plants should couple that support with strong clean energy policies, efforts to limit rate increases to consumers, and rigorous safety, security, and performance requirements. Read our executive summary or full report for a complete discussion of our methodology, findings, and recommendations.